Discussion in 'Buy, Sell and Trade' started by falseintensity, Dec 26, 2011. ^ Is it possible that this is an authentic Fozzie bear? OMG I CAN'T BELIEVE IT! I WOULD LOVE TO OWN MY OWN FOZZE BEAR. But... isn't 4,500 kinda cheap for it? I wanna get it, but I have a feeling it will go WAAAAY over 4,500. Can someone tell me if they think I should bid on it? Please click the link above and tell me! I think it would go for 10,000 at least and I'm pretty sure I would pay that much to hold it in my very own hands. Obviously, you're talking to a super duper Muppets fan here! Anyway, what do you guys think?? Muppet fan 123, TheVoiceGuy and KermieBaby47 like this. I never know to trust these things but if it's true then that is Super Cool!! WOW! That seems official to me! This is certainly a once in a lifetime offer. Best wishes to anyone who wins him. Let's hope that give him a good home too. Looks real to me. 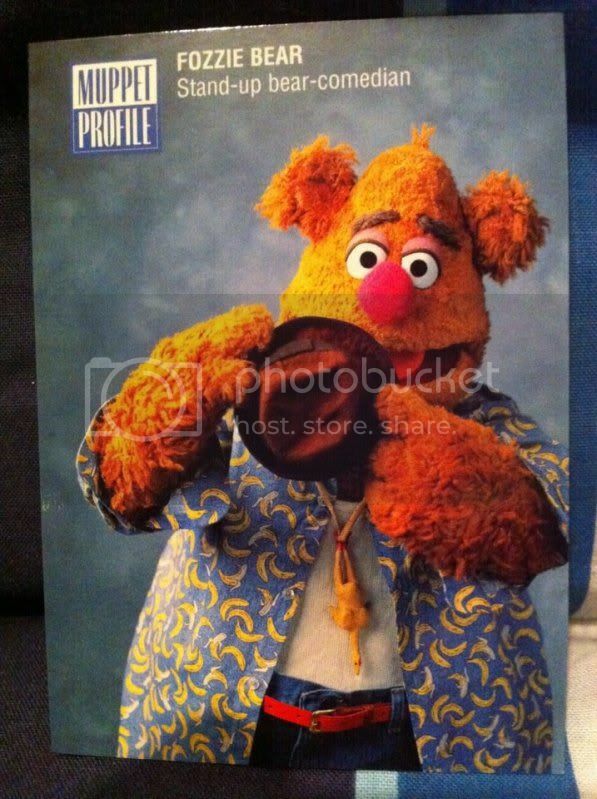 The outfit is what fozzie is wearing in a still photo used in the trading card set and the uk phone card set. It looks like a photo puppet and not a puppet. The label says photo muppet mmII which was the temp name of the great muppet caper so maybe he's from 1980-1!! Wow! 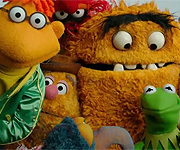 Didn't they build the photo Muppets in the Muppet Workshop in NYC, right alongside the Muppet puppets? The tag does read "made in the U.S." What a find! His clothing looks like he could have been made for either Rocky Mountain Holiday promo shots, or maybe for one of the Viewmaster reel series (which are extremely awesome!). The rips and tears shouldn't be a problem for the high bidder, minor stuff. The inner damage they mentioned (probably foam deterioration) could be more involved, but Fozzie's definitely worth it! Find or make him a hat and tie (or with his clothing, a tie probably isn't necessary), and he'd be perfect! EDIT: Whoops! Didn't see that Chris already stated that he's from a trading card set. Very cool! This is the piccy I was thinking of! He did have his hat, but must have dropped it, and a rubber chicken tied round his neck. He also wears a white T-Shirt under the shirt?? falseintensity you can spend the 4500? I hope you get it. Looks like you justed posted to your competition as it looks like Muppetfan123 is the high bidder (or maybe it's not him). I wish I could spend that much. Are you bidding against him? Just curious if you decided to bid anyway since you said you don't know if you can trust it. Whoever wins, post more pics!!! Seems to be legitimate, so happy! Whoever got that is a lucky fellow! Or lady of course. Waiting to put my bid in towards the end. Gotta work 2 jobs if I wanna afford that, haha! They used the same photo for the phonecard, but they reversed the image to make it look different. They certainly did. I have the phone cards to. Fozzie also wears this in a group line up with sunglasses also used on the trading cards and a bt phone card. I wonder if this auction will go right through.Previously, there was a Kermit and a Fozzie and they were both stopped. This is amazing. Too bad this is something I can't afford. I just hope a true Muppet fan wins this and takes good care of it, and restores it. Beautiful! The auction is closed now. Anybody win here? Last I saw it was at $3400 by muppetfan (may be not our muppetfan). 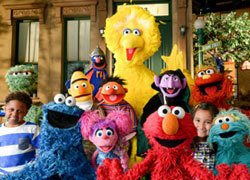 Go for it!If anyone I would want it to go to a true muppet fan! :Your bidding on my??? :WHY NOT MOI!?! ?